Autumn leaves behind the hurry and hubbub of Big Wes Turner’s Trio’s summertime performance schedule. Are we relaxed? Before I answer that, let me wipe up this spilled coffee (only my third cup) and bring you up to date. It may seem a bit mendacious and can be a little confusing. Big Wes has always been a man of mystery. We have a few photos but none that give us more than a glimpse, no more than an intimation of the true stature of the man, the musician, the legend. Hmmm. Well, maybe. Who can say. Really. Doug has a lively imagination, and there’s plenty others who claim to have seen Big Wes recently. Somebody saw him last, that’s for certain, but as a bona fide founding member of his Trio, I can swear and attest that it’s been a good long while since any of us three have laid eyes. But that’s not so important, because the spirit of Big Wes Turner is alive and well. 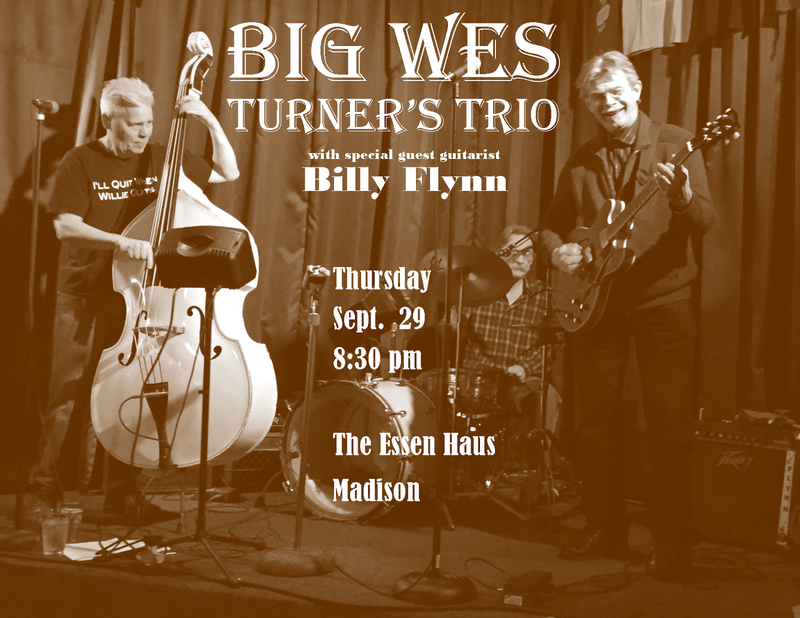 If you don’t believe me, come down to the Essen Haus this Thursday night (that’s September 29) and hear the Trio cut loose on the expansive repertoire for which Wes was known. Ahhh! IS known! NOT past tense! (Sorry. Compulsive alliteration.) NOT dead! Not necessarily dead. No proof. Say no more.